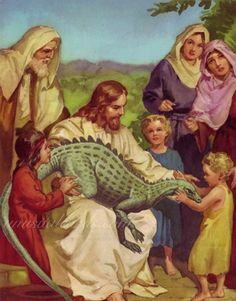 Jesus says, "Stroke that dragon,"
we all know the Creationists are that rare breed of Holy Book Reader who believe that, God created the Heavens and the Earth in a corporate week, then Adam from dirt and Eve from his rib. They also believe that if you count backwards through all the ages of the begat begat begat lists in Genesis, and add up the ages of the begatters, you get an Age of the Earth as young as 6,000 years. Whether you believe the nonsense of the Noah Flood story (about 4,000 years ago) where pairs of known animals (including penguins, obviously, and kangaroos) were gathered together on a really big coracle and retained for future population of nature, big floods is a great explanation for insanely-fast fossil-ising events such as the ones that create layers of dinosaur-rich deposits. While Free Planet does condone Bible teaching nor does it agree with such utter Creationist propaganda, this video heavily promoting the ideas of the Institute for Creation Research goes into great depth and speculation about the ARC or ALTERNATIVE ROCK CREATION (Cataclysmic Moment) Theory I hinted at in my earlier post about Michael Cremo's Ancient Human Cousins. Have geologists got it right about sedimentary formation of rock layers or is it more about the Meteor Impact Tsunami Model? We all know, and accept, that even the most fanciful Creation Myths have 'some semblance of truth' buried within them and Oral Tradition aka Chinese Whispers allows for embellishment and natural evolution of a story, let's start to REALLY THINK and rewrite what we've been taught by cynical and manipulative corporate/religious/scientific indoctrination. Let's really start to examine our Free Planet.